Programmable Wireless SIMs cards come in all sizes to fit into any cellular connected device. The Programmable Wireless section of the Console enables you to manage your account and to order and configure SIMs, whether SIM Starter Packs and/or Multi-Size SIM cards. In the next 5 minutes, you’ll learn about the Twilio SIM, how to get one, and how to register it to your Twilio Account. I'm ready. Let's get my Programmable Wireless SIMs. How do I order my Programmable Wireless SIMs? You order programmable wireless SIMs from the Console. You can order SIM Starter Packs, Multi-Size SIM cards, or Embedded SIM packs. What’s the difference between a SIM Starter Pack, a Multi-Size SIM Card Pack, and an Embedded SIM Pack? SIM Starter Pack A SIM Starter Pack contains three multi-size SIM cards (2FF/mini, 3FF/micro, and 4FF/nano) per pack. 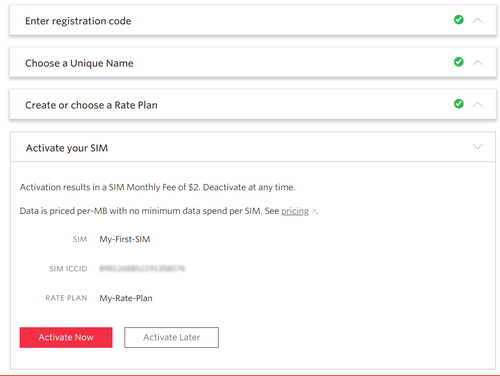 SIMs in a SIM Starter Pack are not pre-registered to a particular Twilio account and come with registration instructions so that they can be easily shared with other developers on your team. Multi-Size SIM Card Pack A multi-size SIM (2FF/mini, 3FF/micro, and 4FF/nano) card is pre-registered to your Twilio account and ready to configure when the order is shipped. The minimum order quantity is 10. Embedded SIM Pack Used for IoT, Embedded SIMs are solderable SIMs, pre-registered to a particular Twilio account and ready to configure when the order is shipped. You choose which SIM pack you want using this form in the Console. SIM starter packs are easily registered using the Console. To get started, click the next button below. For information about using Embedded SIMs, contact Twilio sales. Now, let's register and activate my Starter Pack SIM. Register a SIM to your account in a few minutes using the SIM registration workflow. The registration code is the unique alphanumeric code written above the barcode on the back of a Programmable Wireless SIM. Select SIMs from the Programmable Wireless menu. Click the red + button and select Register a SIM. Enter the SIM’s registration code. Accept the Programmable Wireless Terms and Conditions to continue. Click the Register SIM Card button. The unique name is a convenient way to identify your SIM through the REST APIs and in the Console. A Rate Plan describes the capabilities and restrictions of each SIM associated with the plan. You can create a Rate Plan or select from an existing Rate Plan on your account. 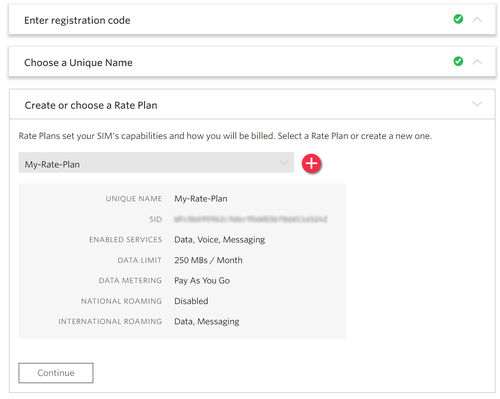 If you don't have any Rate Plans on your account yet, you can create one now. Click the red + button to open the Create a Rate Plan wizard. Detailed information about Rate Plans is available in Understanding Rate Plans. The Rate Plan is now set. You need only activate the SIM to complete the registration. My SIM’s registered. What’s next? Your SIM is now able to register to the cellular network. The next step is to configure your phone’s APN. See APN configuration for details.